At the end of Chapter 10 “A Space of One’s Own” in A Better Pencil, Dennis Baron discusses the idea of the ‘reader-writer’; a being who is created by the multiple-authored open texts like Wikipedia and Urban Dictionary, whereby they both read and edit/author texts. Baron continues by commenting on the fact that this kind of reader-writer community creates less of an emphasis on isolation and makes reading and writing more communal: “We have come to think of reading as an isolating activity in the modern world, one that we do quietly, alone, and for ourselves. But the wiki returns reading to a communal space, inviting us to recognize the reader-writers who came before us as well as those who will follow” (206). Though Baron only touches on this idea of a formerly isolated reader who now can more readily join a community and become a part of this community through writing and reader, I want to spend a little time exploring it further. 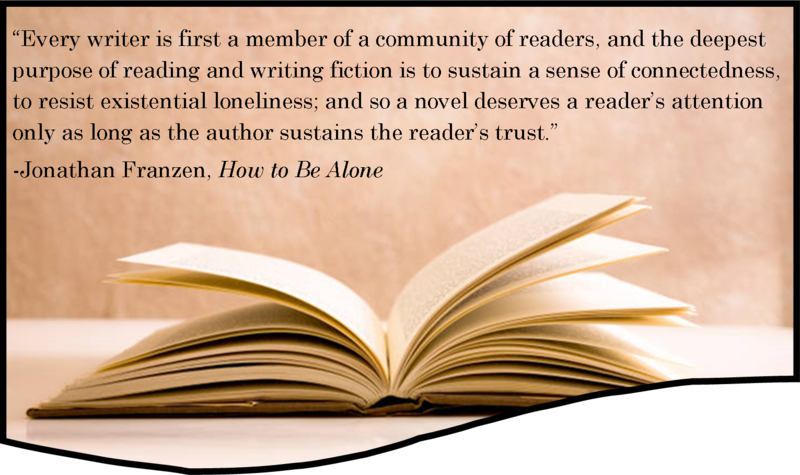 I was reading Jonathan Franzen’s book How to Be Alone [Quotes for fun] recently, which is a book of his essays on many topics. Probably the best known essay of the book, “The Reader in Exile,” notes that even though technology does connect us to other readers and writers (and reader-writers), reading and writing are still isolated activities. Franzen takes the position that reading a physical book has become a tactic of sorts, whereby we secretly devour a medium of reading that is more passé. He also argues that though technology is currently seen by some critics as being anti-reader and might even destroy reading (reminiscent of Baron’s opposition), readers will always be drawn to books and will read and think in isolation (the development of the self, he argues, occurs inwardly, through much thought and evaluation). In fact, Franzen argues, all of us reader-writers have become even more isolated. From a New Yorker article by Jon Michaud, where Franzen discusses his friend David Foster Wallace’s tactics in writing Infinite Jest, Franzen argues that the act of reading in this age of technology has become even more isolating rather than less isolating. The reader and the writer (and the reader-writer) might be more isolated because though there are some collaborative communities in the internet world which privilege a joint writing venture, the fact of the matter is that most writing is still done for oneself and by oneself, and most reading is either done in secret as a tactic (with physical/digital books) or collected piecemeal and distributed to us in feeds and emails and on tabs that we skim and think about and move on from. Further, though the internet may give us a place where we can discuss books and share writings with others, this kind of collaboration was happening long before the internet in the form of book groups, public lectures, manuscript sharing, and writing workshops. That said, I’m not sure what I think about the subject, as I enjoy the fruits of both internet reading/writing and non-internet reading/writing. I am pretty convinced that, as much as we would like to praise the idea of the reader-writer, these acts (whether joint or separate) are still isolating in many of the same ways that they always were. I am also pretty sure that this sort of isolation is not a bad thing; how else can we develop inwardly as people who have struggled by themselves with complex ideas and conceptions of morality? “I’m not sure who I am, but I know who I’ve been,” or do I? As I’ve become more acquainted with the web since I first started “blogging” on LiveJournal and obsessively updating my Myspace and Facebook pages as a high school student, I realize that, besides the fact that I haven’t gotten much better with using technology, I’ve changed the way I view myself and the way I want to present myself to the people who “follow” my online life. I went from solely complaining about what it was like to be an angsty teenager in his first “real” relationship in high school to trying to establish what Lena Dunham would call a “quirky web presence” for myself: one that combines the necessary personal flairs to keep people interested and to allow them to get to know me but also aspects that reach beyond just me and into the culture in which I am immersed. As my few Facebook friends would tell you, “culture” for me usually ends up being something along the lines of sharing my thoughts on Britney Spears’ newest train wreck of an album or praising Lorde for being the fresh, weird New Zealand goddess that she is. But my trends in posting over the last seven years have shown a dramatic shift in who I am as an individual, and maybe even as a writer. I like to fancy myself a bit more “evolved” these days, especially when I can make a wisecrack about literary theory and popular culture at the same time. That’s all well and good, and I like the way I am on the web; I just wish there was more of me to go around. But in addition, the way in which all these social media tools, both new and old, create a digital archive of past posts also has some important implication for how we can view ourselves are writers, readers, and individuals in a digital age. Even though I can’t bear to read my old LiveJournal posts (anywhere from when I first started it in 2005 until around 2008), who I am now is drastically different from who I was back then. And I can see the transformation even in terms of how I presented my narrative on the strictest textual level: the younger I was, the more inclined I was to experiment with fonts, size, bolding, italics, underlining, strikethroughs, and whatever other “flairs” LJ offered. Although I’d like to hope that I’ve retained some sense of being that kooky kid in personality, my prose itself, in terms of how it appears on the screen, has become much more streamlined – perhaps out of maturity, or perhaps out of embarrassment for my old ways.